You don’t need to look any further than Apple’s stock price over the past several months to know that they’re on a roll. A year ago, the stock price was at about $190 a share. Today, it closed at $317.93 a share — an all-time high. In fact, they’ve hit several all-time highs this month alone. Their market cap is quickly approach $300 billion. And now the company has just announced their Q4 earnings. And once again — boom. But a boom with a couple caveats. Just as with last quarter, Apple easily beat the earnings estimates. The company posted $20.34 billion in revenue and $4.31 billion in profit — both new records for Apple. EPS was $4.64 (Wall Street consensus had been $4.06 and Apple’s guidance had been $3.44). A year ago, Apple posted revenue of $12.21 billion with a profit of $2.53 billion ($2.77 EPS). All that said, gross margin did drop a bit, to 36.9 percent down from 41.8 percent a year ago. Given how quickly the iPad sold out of the gate (3.27 million in the first quarter it was available), the 4.19 million may seem a little low. But that also means Apple sold more iPads than Macs for the first time — and again, it only took two quarters of existence to do that. 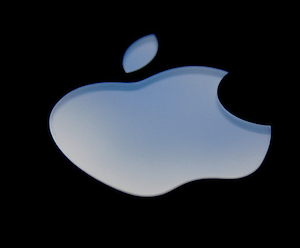 We’re extremely pleased to announced the conclusion of a great year for Apple. New all-time records for Mac, iPhone, iPad. Highest quarterly revenue and earnings ever. 3.9 million Macs — new record by over 400,000. 27 percent year over year growth. Double digit growth in both portable and desktop. iMac and MacBook very strong. 3 -4 weeks of Mac channel inventory. 9.1 million iPods vs. 10.2 million a year ago. But we just announced new ones. iPod is still the top-selling MP3 player in most of the countries we track. iTunes revenue over 1 billion dollars this quarter. iTunes 10 is out there now. 14.1 million iPhones versus 7.1 million a year ago. Huge growth. 166 carriers in 89 countries for iPhone now. Asia, Europe, and Japan are very strong. And we’re in China now too. Almost 4.2 million iPads sold — now in 26 countries. Revenue from iPad (and accessories) was $2.8 billion. We have 3 to 4 weeks of channel inventory now. Expanding to Walmart, Target, Verizon, and AT&T stores now. 200,000 registered iOS developers now. We’re pleased with iAds so far. 317 stores worldwide now. 84 outside of the U.S.
40 to 50 more stores in FY2011 we think. We’ll be replacing some stores in the U.S. too. Cash now $51 billion. Increase in $5.2 billion this last quarter. full year sales 40 million iPhones. 7.5 million iPads sold so far. This year, Apple generated 5 times the revenue and 10 times profit we did 5 years earlier. I don’t usually participate in these calls. But I just couldn’t help dropping by for our first 20 billion quarter. What about Google? Last week Schmidt reiterated 200,000 devices — they have 90,000 apps. We activate 270,000 iOS devices a day for the last 30 days — nearing 300,000 now in a few of those days. 300,000 apps now. “We find this a bit disingenuous” – re: open versus close. When you hear open you think Windows — but Android is very fragmented. “Twitter client TwitterDeck (TweetDeck — I assume)” — multiple hardware and software iterations provide a daunting challenge. There will be at least four stores on Android. This confuses customers and makes it hard on developers. Google flirted with this with the Nexus One phone. But this is a smokescreen. “Fragmented versus Integrated” — Android is becoming more fragmented by the day. We think Apple and not the users should be the sys admin. We are confident it will triumph over Google’s fragmented approach. Almost all use 7 inch screen — iPad nearly 10 inch screen. Users have to sand down their fingers if they want to use these. 7-inch tablets are “tweeners” too big for a smartphone, too small for a tablet. not enough apps. poor pricing, etc. Q: How are constraints on iPad now? Tim Cook, COO: We’re in good shape now. We have new partners and inventory for the upcoming holiday quarter. Q: What are the headwinds on gross margins? PO: We did say we thought there would be some — but we did better than we thought. iPhone sales were huge. Q: Steve, talk about the iPad opportunity. What do you think of this business a year or two years down the road? SJ: “The iPad is clearly going to affect notebook computers.” I think the iPad proves it’s not a question of “if” but a question of “when”. Things will continue to change over the next few years. It’s surprising how much interest there is in business. “It’s being grabbed out of our hands.” From board rooms to nurses and doctors and hospitals. “The more time that passes, the more I am convinced that we have a tiger by the tail here.” This is a new model of computing that we already have people trained on thanks to the iPhone. Q: Will this be the second biggest business (behind iPhone)? SJ: I can’t predict. We’re already shipping more of them than Macs though. Q: Any updates on Flash? SJ: Flash memory? We love flash memory (laughs). Q: How is iPad supply/demand. TC: It has been extraordinary, I can’t predict when we’ll be able to meet demand. iPhone 4 took iPhone demand to a whole new level too. Q: You are the tablet market right now. Can Apple sustain share growth for tablets? SJ: I have a hard time envisioning what competitors strategies are. They can’t match us in price. Flash hasn’t presented any problem at all. Most of the video on the web is now in HTML5. We’re out to win this one. And we’re not done yet. Q: Why are margins going down? PO: It’s a higher than expected mix of new iPods and more iPad sales — pricing is very aggressive. Q: How is your hobby doing? Apple TV. SJ: We don’t talk about unannounced products, but I’m happy to talk about Apple TV. We have gone to a streaming model — it’s complete streaming. Soon to be streamed from your iPhone and iPad too with AirPlay. I can report in a short amount of time we’ve already sold a quarter million. Over 250,000. It’s a great product and its 99 price point is very enticing. Q: What about the market share play for the iPhone? Q: What about the tablet competition? SJ: The reason we wouldn’t make a 7-inch tablet isn’t because we wouldn’t want to hit a certain price point, we just think it’s too small for the software. Q: With over $50 billion in cash now, what about returning money to shareholders? SJ: We believe there are one or more strategic opportunities that may come along. And with the cash we have, we can do something. The money isn’t burning a hole in our pockets, we’ve been smart with it. We’d like to continue to keep our powder dry. There are one or more strategic opportunities in the future. Q: What about other carriers for the iPhone? A lot of pressure there? TC: The pressure is really only on the supply. Everyone we’re doing business with wants more supply. That’s the pressure I feel. Q: Why do you think you have an advantage on the price point with the iPad? SJ: Part of it is that we engineered so much of it ourselves. We did the A4 chip. And we learned a lot from the iPod and iPhones. Others have to buy things on the market with middlemen, who take a cut. We’re efficient. This is a product we’ve been training for for the past decade.